Today was a day off from school. Brock only did his "board check" this morning and then he had the day off from work also. His work took about twice as long as it should have due to spotty internet coverage with both our mifi and the campground wifi, but eventually he was able to finish and we all got out the door very late in the morning (like almost noon again!). Our first stop for the day was the Angel Oak Tree which is an amazing live oak which is estimated to be 300-400 years old. The circumference of the trunk is 25 feet. It provides 17,000 square feet of shade and it's longest branch is 89 feet long! It is just so huge and beautiful. 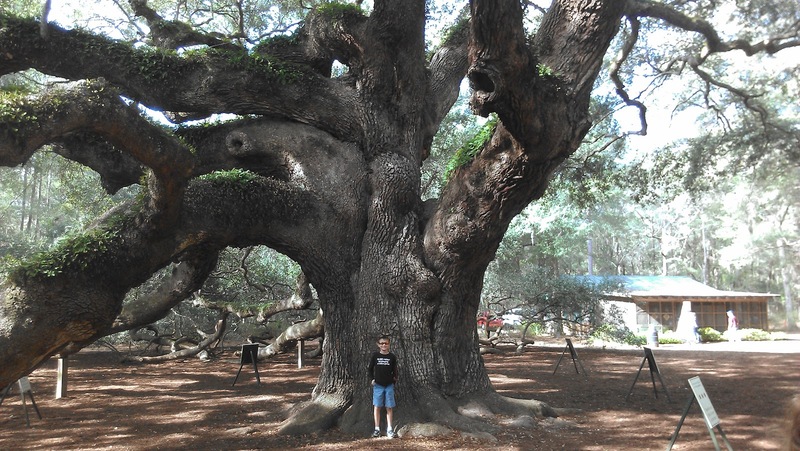 It is called the Angel Oak because Angel was the last name of the original owners of the property where the tree is located. Brock spent some time visiting with a gentleman in the gift store and he gave us some ideas on where we might find boiled peanuts to try and he also recommended that we check out Charles Towne Landing State Park. We headed from there to the first possible location for boiled peanuts. First impressions were good. The trailer looked clean and friendly. The nice man inside said there was just one problem, he sold fresh shrimp not peanuts. :O) He was so nice and told us we SHOULD try boiled peanuts and told us to make sure and take the shell off before we eat them. He told us there was different flavors and that we should try a flavor instead of plain at this time of year since the peanuts would be dry. (??) He told us that if he had boiled peanuts he would be eating them right then. He also said to just keep our eyes open for stands alongside the road. As we were leaving, he came out of his trailer to the car to give us a handful of Georgia pecans. He said he realized that we probably didn't have those in Oregon either and that we should try them. Brighton tried his pecan tonight and said it was really good...sweet. We punched in Charles Towne Landing onto the gps and started driving that way. On the road, the gps alerted us that there was a Diners, Drive-ins & Dives location in the area. We decided to be spontaneous and give it a shot. We maneuvered to Early Bird Diner and saw a fairly full tight parking lot which is always a good sign. 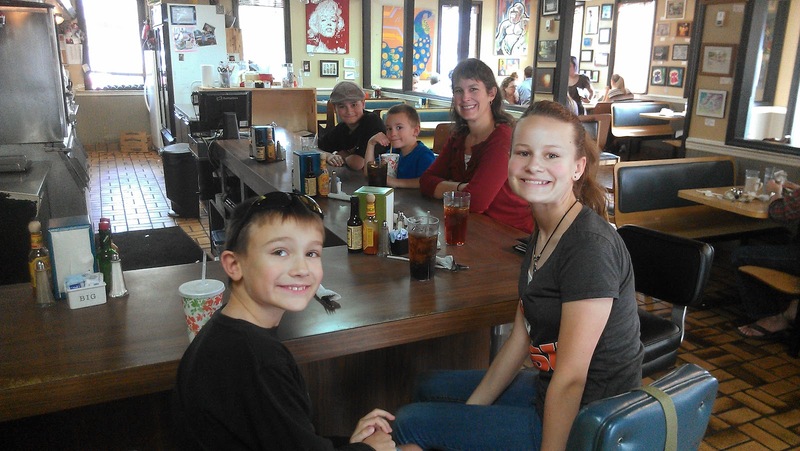 The six of us walked in and sat at the counter which was a new experience for all of us. It was a fun funky place. Guy Fieri's autograph was on the wall just above the door to the kitchen which was right in front of us. 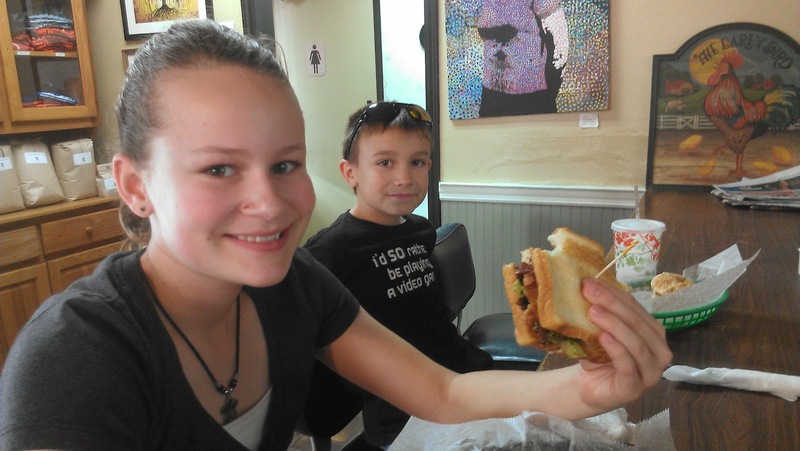 Skylar was not TOO daring and tried a grilled cheese with french fries, but he thought they were good. Brighton had fried pickles with a side of homemade mac n'cheese. These were homemade pickles, breaded and fried and served with a homemade remoulade. I don't think Brighton like the pickles as well as the ones we tried at Fish Tales, but I thought they were great. 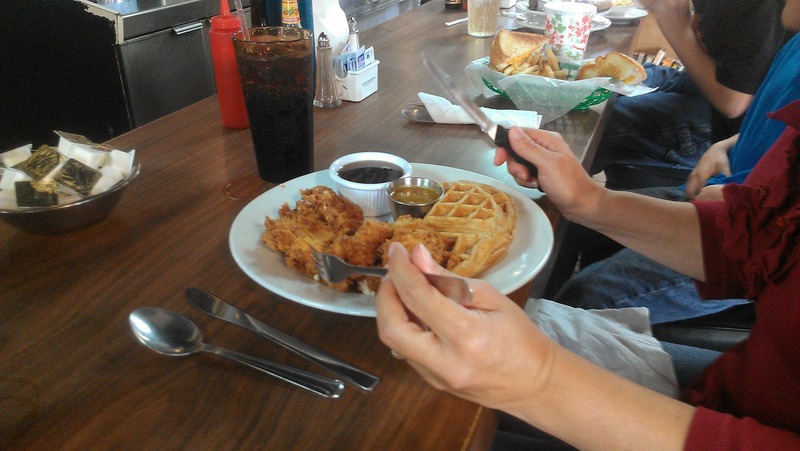 I tried chicken and waffles which I'd heard of before, but never tried. The waffles had cinnamon in the batter. The chicken was perfectly breaded and fried extra crispy. It was served with a homemade honey mustard and maple syrup on the side. Really delicious! Brock got chicken fingers (which were just as good as my chicken) and fries. Brynna had a FGT (Fried Green Tomato) sandwich with bacon and the same remoulade and fries and she liked it. Spencer had a kids burger with a side of fried okra. Crazy right? Everyone enjoyed the experience there. We did decide the boiled peanuts would have to wait until tomorrow because we were all stuffed. One of the funniest things was that they had their tea dispensers with fresh-brewed iced tea filled with a locally made tea, and they had the pictures above them "Unsweet T" and "Sweet T". From the restaurant, we drove to Charles Towne Landing State Park. It was the site of South Carolina's first settlement in April 1670. There is an animal park section with animals that the settlers would have seen here. We enjoyed seeing birds, bison, loved the otters, white tailed deer, bobcat, skunk, and were a little creeped out by the turkeys. From there, we walked along the trails and saw a foundation of a plantation house, a slave cemetery (which there was really nothing left of), a long replica palisade, some mounds and cannon and trenches for the settlements security, a common house which had a dirt floor and showed how an indentured servant would've lived. There was a little bowling game near the house with a wooden ball and pins. We continued on the paved trail and came to the river where there was a replica 17th century trading vessel called Adventure. We got to go aboard and the kids climbed into the crew bunks. The last park of the trail winds past a fancy house and gardens of the family that owned the lands that eventually were turned into the park. They were very beautiful. At the pond near the house, we saw an alligator in the shallows. While we were all looking at it, there was some discussion as to whether or not it was real since it was so still. We looked very intently and I took a couple pictures. As I turned around to join the family that had started moving down the path, I was just in time to hear several squeals and see everyone jump as a squirrel came out of the bushes across the path. It was hilarious! the glass as the kids ran back and forth. Can you believe it is January? Beautiful flowers and a high of 76 degrees today! More of the settlements security apparatus. Do you think Spencer has a future in acting? Aboard the Adventure looking for little fish in the river. who had the foresight to donate the land for the creation of the park. The alligator in the pond. We came home and had a quiet evening at the trailer. What a neat day! The Angel tree is huge! Loved that you guys got to eat at a diner that Guy Fieri visited. I've always wanted to take a road trip to eat at those diners. I just wanted to comment on the boiled peanuts you are waiting to try. They are addicting like Lays potato chips, lol. It's got to be the salt. I've never had "seasoned" boiled peanuts only the ones boiled in salted water. I've never made them but have a friend in GA that makes them. They take a little time to cook and then you have to have room in your fridge to store them. Enjoyed seeing the pretty flowers in January. It was 1 degree this morning at 7:00. BRRRR!